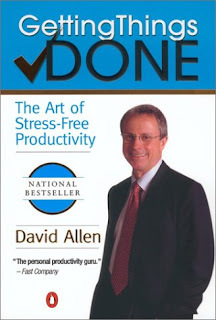 The book this week was Getting Things Done The Art of Stress Free Productivity by David Allen. A great book about how to... well... get things done. Personally, I believe two big portions of professional conduct are organization and producing results. This book will teach you how to change your lifestyle and get enormous results in each of those areas. This book was incredibly detailed. I would be shocked if someone told me they couldn't get results after reading this because some of the baby-steps the author uses are almost excruciating. But to be fair, that is what it takes with some people to install life changing behavior. Now let's talk about a couple concepts from this book you can implement in your life to make you a better, more professional, and overall, a more promotable individual. The BIG idea from this book is simple. Write 'stuff' down. Somehow, find a way to transcribe ideas to a device. This device can be a notepad, a cell phone notebook, a PDA, etc. (I have started using a memo pad, you can buy a set of three at Target for $1.97) This idea is so incredibly helpful, yet, I have been battling it for some time. It could be because I was stubborn or that I thought I could do without it. But regardless the reason, I was dead wrong. The brain cannot remember everything you need and at the same time release the information when it is needed. For those of you familiar with computers... The brain processes ideas a computer uses RAM, it's temporary storage. As amazing as the human mind is, it's kind of dumb, as the author points out... when you are at the store looking at the battery section you don't think of the flashlight you have a home with dead batteries. You know that the batteries have been dead, but your mind just doesn't use that memory when it's most effective for you to have it. Your brain will shoot out ideas all day long... "I need to take my dry cleaning"... "I need to get buns at the store"... "I need to take that package to the post office." Those ideas come into your RAM and unless you focus on them until they are done, they will leave you. You can conjure up that idea again, but the time to conjure takes time and depending on the task... unnecessary stress. If you immediately transcribe all the ideas you have as soon as they come in you won't be using up brain space for that task anymore, and you won't have a delay in you day trying to come up with the idea again. It is much more valuable to be thinking about different things than it is to think of different things. Use the power of your brain to make your action plan most effective instead of just sitting around thinking about things to do. It doesn't even matter what the idea is, if you transcribe it you will review it later and weed out the useless. The important part is that all ideas that come in are going out of your brain and onto something reviewable. I started transcribing ideas earlier this week and have had tremendous results. I can't put an accurate percentage on my increased efficiency. But if I were to ballpark it, I would say I am around 60% more efficient. I know... pretty impressive. The next step is to review. Weekly you should do a review of your notes and weed out information. If it is something that is not actionable then you can either: discard it, save it for a reference, or but it in a someday/maybe file. If it is actionable then you need to come up with an action plan. Your idea to get your car tuned up becomes actionable by breaking it down. You'll need to look for different mechanics' rates, make a decision, and make an appointment. When things are broken down you have a clear, concise road map. In addition to your weekly review, you will be referring to your transcription device very regularly. As soon as one task gets done you should have another task on there to work on. The time reviewing won't be extensive, just a few seconds here and a few there and maybe 15 to 30 minutes to create action plans for your larger projects. The author defines a project as anything that has more than one step to completion. When your plan is actionable you have a few solutions for getting it done. Do it, Delegate it, or Defer it. I think each of those is pretty obvious so I am not going to Dr. Seuss this for you. 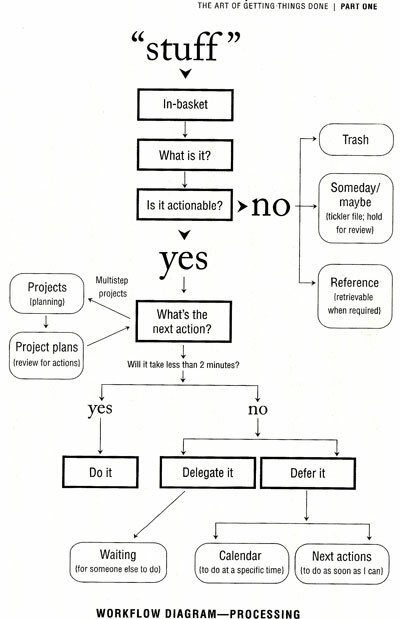 But I will show you a work flow diagram that is used frequently in the book. It should give the big picture of what I'm talking about. The other part of being stress-free while establishing your new lifestyle to know your limits. Your work flow is like a credit card. If you don't know the balance or limit of a credit card it is easier to be irresponsible. With your work flow you should now know your balance because you should have everything you need to do written down, but your limit is something you will have to decide for yourself. If your plate if full then you need to feel comfortable saying "No" to a new task asked of you. Overloading yourself will cause you to be less productive in the long term because it will weigh you down. But again, this is variable, everybody is going to have a different limit and as you become more effective you will increase your ability to do new task and in essence raise your limit. There is a lot more to this book than what I have explained here. It goes far more in depth and gives a lot more neat tips on organization and effectively sorting your 'stuff.' I think this book is great for most executives that have information coming and going more than most people out there. Having an effective way to deal with all that information flow help in enormous ways. Lastly, don't be stubborn like me, write things down and review them regularly. You increased efficiency is sure to turn some heads! If you have any questions on the book don't hesitate to ask. I would be more than happy to help anyone that wants it. Trevor ... what irony! I have had the book for a year and tried to implement it last summer unsuccessfully. I am giving it another shot ... discipline is the key and boy im working at it. You should check out his presentation to google staff - a video explanation of the book - if you will.